Meme Instructions: Create an image depicting what you consider to be geeky/nerdy/dorky and/or answer the following questions! Don’t forget to leave a link to your post in the comments and if you do a picture for this meme, feel free to share it in the blog memes flickr group. 1.What do you consider yourself to be? Geek? Nerd? Dork? None of the above? All of the above? – I’m a Gerdork, I guess. 2.What was the first computer you ever owned? – Hmm…I think it was a 386 something, maybe an HP? 3.When and how did you first get on the internet? – Probably AOL…I don’t have a clear recall. 4.Which geek fandom do you subscribe to? – Gamer stuffs and of course virtual worlds. 5.Star Trek or Star Wars? – Neither. 6.How Geeky Are You? 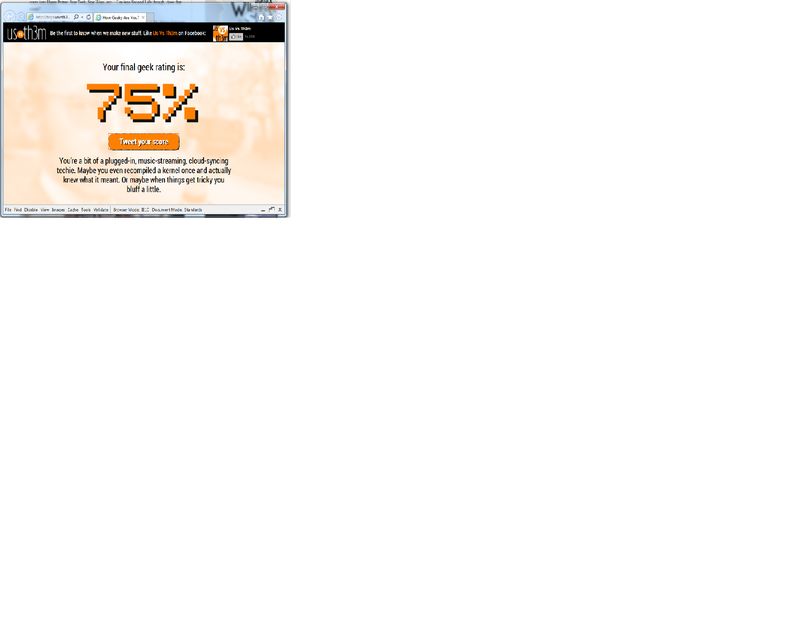 – I took the test and got 75%! OMG…this can’t be good!